97 Wey, Max O - Swiss. 389 Karrlein, Peter Helmut - German. 558 Palani, Chandara Mo Han - Australian. 559 Panagiotis, Theocharis Theodoros - Greek. 569 Paycn, Cyril Amedee - French. 583 Pollock, Jacqueline Ann - British. 586 Por, Lee Kwan - Malaysian. 587 Prasso, Sheri Teresa - USA. 598 Rafn, valdimarsoon Omar - Icelandic. 599 Ragnhild, Skinnes - Norwegian. 605 Raymondas, Martinkus John - Australian. 611 Ricaard, Jury Miles - British. 621 Roberts, Sue Lloyd - British. 623 Ronny, Hansen - Norwegian. 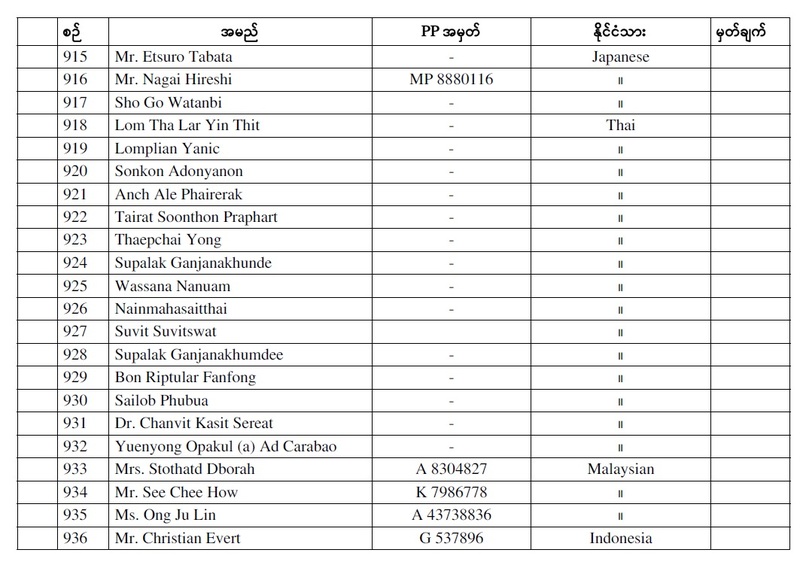 626 Mr. Pitak Chulapa - Thai. 628 Rye, Ishida - Japanese. 638 Sana, Ellene A. - Filipino. 639 Sanchai, Sakulsureeyadej - Thai. 650 Schmiot, Axec - German. 652 Scott, David Adam - British. 663 Shibe, Mitsukaza - Japanese. 664 Shinishiro, Hori - Japanese. 666 Siew, Fook Matthew Loke - Malaysian. 667 Sigrit, Hervon Barbra - German. 669 Silva, Rosalynn Serafica - Philippines. 670 Sim, Matthew - Singaporean. 672 Siri, Bunjong - Thai. 673 Skehan, Craig Alexander - Australian. 674 Smith, Judith Anne - British. 678 Snider, Eric - Canadian. 683 Solhein, Erik Buobrand - Norway. 690 Stothard, Sheryll Christino - Malaysian. 698 Sumatie, Lynette - British. 699 Summers, Colin Anthony - British. 700 Sweeny, John Paul - British. 701 Suan Khan Taung - Myanmar. 703 Suthin, Nophaket - Thai. 704 Suvannapal, Tarinee - Thai. 705 Sylvia, Saw - Singaporean. 706 Somsri Hananuntasuk - Thai. 709 Tancred, Alastair Lawson - British. 711 Teufel, Hans Heinz - German. 713 Thamanatha, Puvanendran - Malaysian. 732 Thomas, Katherine V. - British. 734 Thomson, Suteera - Thai. 735 Thapannarungsri, Pachrin - Thai. 750 Triagus, Siswowharro - Indonesian. 752 Tun Khine (Dr) - USA. 755 Tutako, Katayama - Japanese. 756 Tzuoh, Diong Chi - Malaysian. 757 Tadzrul Adha Bin Mohdiahir - Malaysian. 759 Uppahad, Sawat - Thai. 761 Urofsky, Susan Linda - USA. 769 Vicary, Alison Mary - Australian. 771 Vicky Bowman - British. 774 Vojislav, miladinovic - Danish. 775 Wain, Barry John - Australian. 779 Weggen, Hanja Maij - Netherland. 780 Wei, Chong Kok - Malaysian. 781 Wei, Fong Sau - Malaysia. 782 Weima, Lager Christine - Norwegian. 783 Weiman, Setphen Anthony - Brithsh. 784 Wesnarat, Prayad - Thai. 785 Whittaker, Brian James - Australian. 786 Wilheim, Grieg Kai Fredrik - Norwegian. 791 Woo, Kim Sang (Dr) - South Korean.